Haida Gwaii – Fisherman’s Paradise - Welcome to NIHO Land & Cattle Company Ltd.
By nature and definition, islands are set in and surrounded by water. Along the northern coast of British Columbia, the family of islands known as Haida Gwaii – ‘Islands of the People’ in the Haida language – is set like a huge, multi-faceted gem in the clear, cold waters of the Pacific Ocean. Within and without – the surrounding ocean and the rivers and lakes that thread these islands – the waters of Haida Gwaii are alive with fish, everything from the silver flash of leaping Coho salmon, the fighting tenacity of Steelhead, to the stubborn halibut. Sweet-fleshed Dungeness crabs and other bounties of the brine are also here for the catching, if you’re fast enough. So try your fishing line and luck in Haida Gwaii. With no highways to connect these islands to the crowded mainland, the waters are untrammelled, the fishing possibilities – superb. First, why choose Haida Gwaii over Alaska? Haida Gwaii is right on the salmon migratory route, with millions of salmon making their way down the coast to their spawning grounds. In early May, young Spring salmon make their way into Masset and Skidegate inlets to feed and spawn. Springs are the monsters of the salmon run, with many weighing more than 30 pounds. During the summer, all five species of salmon show up on the northern coast of the islands, feeding and growing plumper – some Coho can also break the 30-pound mark. Finally, in late fall through the winter, Steelhead salmon arrive. Although these feisty fish will give even the best fisherman a run for his or her money, it’s strictly catch and release – the most you can take home is a photo and a memory. Haida Gwaii is world famous for its monster halibut catches. The arm-straining boat anchors of the fish world, these fish have been known to top 300 pounds, although the average catch is in the 30- to 40-pound range. 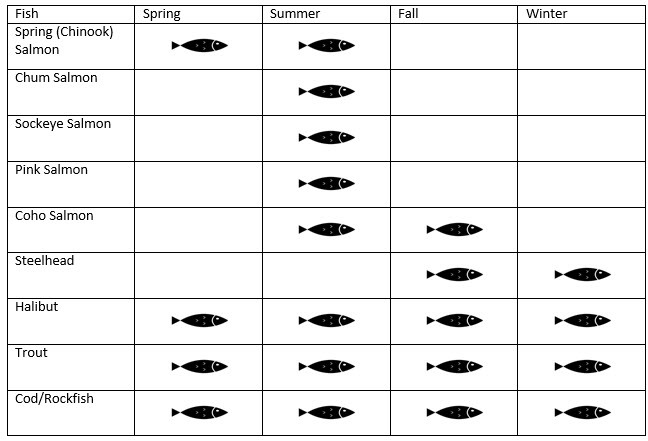 Halibut appear in late May through October . . . and they make for fine eating. Sandwiched in between halibut and salmon -- the cod and snapper runs. The peak season: early June through September. There is something for all budgets for a saltwater fishing adventure. Fishing lodges – Haida Gwaii is well known for its fly-in saltwater fishing lodges, especially around Langara Island and the northern tip. If your favorite movie or sporting star enjoys this type of activity, chances are he or she has probably been here. Charter boats – If you’re looking for something less expensive (or don’t wish to immerse yourself in deep-sea fishing) – try many of the experienced charter guides found around the islands. Check the local tourist-information office for recommendations. One great experience, especially if you have children, is crabbing on North Beach which is located (funnily enough) on the North Coast of Haida Gwaii. The Dungeness crabs here are widely considered to the best for eating – they can reach 23 centimetres across (nine inches) and weigh up to two kilograms or well over four pounds – great for a crab bake! Although you can get and set crab traps for your supper, locals are known to reach out and physically catch these tasty scuttling creatures at low tide along the shoreline. Rent a strong dip net from the locals, and nab the crusty critters just under the surface of the water. Again, ensure you follow all rules and regulations, especially in regards to daily limits and minimum allowed sizes – or that is going to be a very expensive crab dinner. Get your recreational salt-water fishing license, check with the Department of Fisheries for current regulations regarding what you can keep and what must be set free. Once the summer ends and the air begins to chill, the river, lake and other freshwater fishing is just getting warmed up. The Sangan, Tlell and Yakoun rivers are world renowned for excellent fishing. From ocean outlet to its deepest reaches, the Sangan River is well known among fly fishing folk for its sleek Chum, Coho and Pink salmon, Cutthroat, Steelhead and Dolly Varden trout and the not-terribly-handsome (but real tasty) Sculpin. 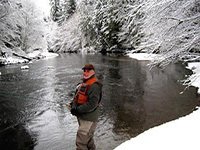 Tlell River is famous for Steelhead trout and Coho salmon in the fall and Cutthroat trout in the late summer. At more than 55 kilometers or 34 miles in length, the Yakoun is the largest river on Graham Island and is the only river on the islands that naturally supports a Chinook salmon stock (enhanced by the nearby fish hatchery). In the fall, dip a line for Coho salmon, Steelhead trout from October to March and Rainbow, Cutthroat and Dolly Varden trout year round. Closer to Port Clements, the Mamin River has a good run of Coho salmon from mid September to mid October, with Steelhead from January to March. Several lakes on the island -- Mayer and Yakoun -- are also popular with the fly-fishing locals. Copper River – probably the most well known stretch of wet on Moresby; look for sea-run Cutthroat and Dolly Varden trout in early summer, Coho salmon in early to mid fall. 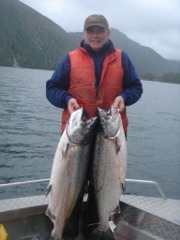 Deena River – a good Steelhead run in the early spring, good Coho in October and November. 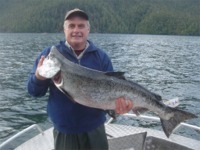 If you seek good lake fishing, try Mosquito and Skidegate lakes near Moresby Camp. Both lakes offer great Cutthroat and Dolly Varden from early spring to early fall. Four seasons of great fishing – now that’s a fishing paradise!